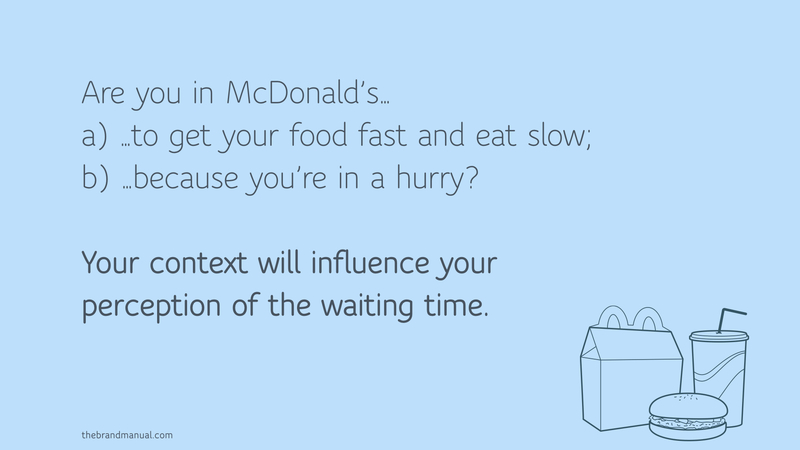 Context is the key to understanding customer behaviour. People act the way they do because of the situation, in which they find themselves. Simply put, if you are in a hurry then a 10 second wait is an eternity. If you’re feeling really relaxed, 5 minutes is an instant. Taking customer context into consideration when improving service touch-points is crucial, because if you don’t, you might make things worse, not better. The above simple exercise also demonstrates the importance of the customer centric approach to service design. Without customer insight, you couldn’t get all six criteria defined. Which by definition means, that you’d design the service wrong. What doesn’t come out in the above example is that one person may have all six different motivations for going to the convenience store. But at different times, maybe different locations. Your context determines your motivation for doing something as well as how you’ll feel about it. With exceptions, most services have user contexts that can be defined. Airports have an unusually large number of stressed people, because they don’t know how long it will take to get to the gate. Hotel bars in sunny resorts have an unusually large number of relaxed guests, who don’t care if dinner takes 10 or 20 or 30 minutes as long as they have a fresh drink in their hand. Ironically, in both cases the defining problem and solution is not faster service, but better information. In most cases, knowing what is going to happen and when makes people relax. Information black-holes, however, when you become dependent on someone else, causes stress to no end. So how do you figure out the context of your customer, before you start mapping their journey in detail? Observation is probably the best way. Some quick interviews with people who’ve “been there” also gives you insight. And the reason for doing this, is to constrain your assignment somewhat. Especially for commercial projects, some customers are just more important (and their context matters more) than others. Context also allows you define the timeframe of your customer journey. Defining the timeframe, however, means that you can make an educated guess about what part of the journey matters and which one doesn’t. Although this sounds callous, it is a fact that not all problems can be solved and sometimes it isn’t your business to solve them anyway. For example, the customer journey from need to satisfaction in looking for a new home might be years. As a bank, you can perhaps alleviate some of the pain points along the journey. But you should be careful about doing too much, or you may be saddled with the blame of a bad purchase in the end?! However, understanding that the customer journey is more involved than looking for a loan is very important, and the earlier you can be visible and helpful in that journey, the more likely it is that your bank will be selected for the loan. The definition of context is “the circumstances that form the setting for an event, statement, or idea, and in terms of which it can be fully understood.” Understanding context often requires empathy, because people are not rational and when very stressed, the actions of people can be quite unpredictable. This unpredictability is predictable though, if you can empathise with the customer in their context. For example, being late to a dance performance may not be quite a life-changing event. But if you are a person that is chronically late, promised your son you’d be there and despite having left the office in good time got stuck in traffic, which never usually happens at that time, and then come late and have to explain, yet again, how it wasn’t your fault and then someone tries to say something inappropriate, it is easy to have a mild hissy-fit. The context of this whole event will have a huge bearing on how you act and react until you calm down. One way at looking at context, is to describe it as a misunderstanding between the customer and the service provider. When everything works the way the customer expects it to work, then the service provider has understood the context in which the customer consumes the service. However, when things don’t work as expected, then the company has made presumptions about the customer that are based on wishful thinking, not observation. Misunderstanding context and motivation can have radical consequences. For example, northern European parents will often leave a baby sleeping outside in the baby carriage even when it is very cold. While they themselves go into a cafe, the baby carriage will be outside. For someone from a culture where that is not common, this would be tantamount to child abuse and criminal negligence. All kinds of problems can come from this kind of misunderstanding and designing services without understanding the context of the customer can have all kinds of consequences, many of them not quite desirable.